The roof of this stadium has been led by IASO, a Spanish company based in Lleida, a pioneer in the application of ETFE. The Spanish company IASO S.A. has carried out the manufacture and installation of the roof of the Zenit Arena Stadium in St. Petersburg, Russia, where, in the coming days, the 2018 Football World Cup will be held. The new stadium, with a capacity for 68,000 spectators, was designed to simulate a spacecraft on the Baltic Sea shore. The enclosure has been covered with a transparent ETFE dome formed by 96 cushions of the same material. ETFE is a lightweight and highly durable material that allows for freedom of form when building, a fact that makes buildings constructed with this material very beautiful with spectacular design. Thanks to its integrative design, the roof can be opened and closed easily, depending on external weather conditions. In addition, the approach of this project guarantees the passage of natural light when the roof is closed, while maintaining adequate conditions for play. 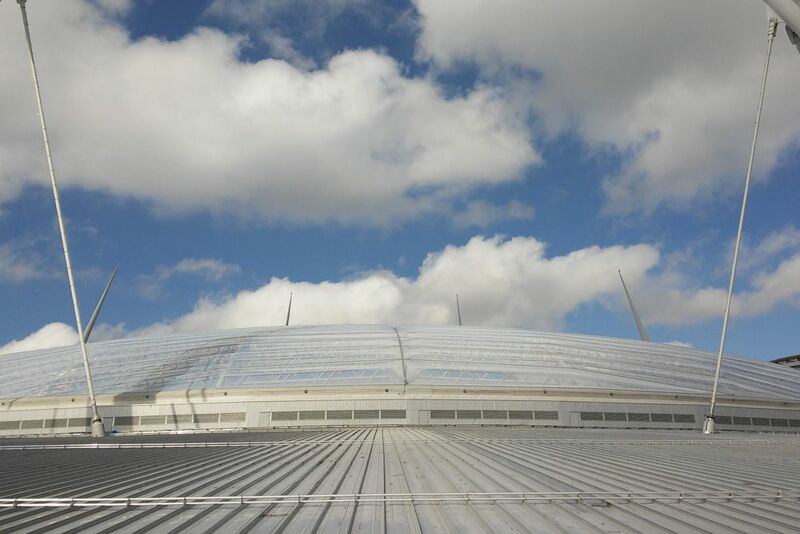 The roof is made of a total of 18,000m², 5,000 of which are made from fixed ETFE and the rest is made of mobile ETFE. With this installation we have achieved a structure with more luminosity, lightness, design, integration and solar control for the new Stadium of the city of Saint Petersburg. This is one of the benchmark projects of the Department of Textile Architecture of IASO worldwide, together with the transparent roof of the Allianz Riviera Stadium in Nice, the construction of the new San Mamés Stadium or the reconstruction of the tribune of the Dijon Stadium, among others.